All Shawl, a set on Flickr. I just finished this one tonight so opted to post pics of it. 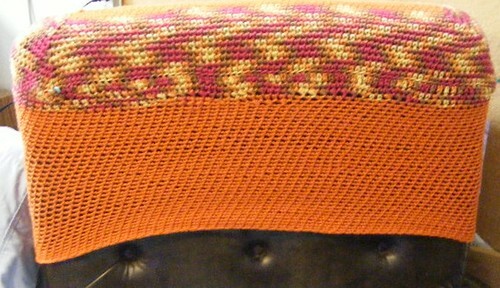 I used Caron Simply Soft Paints, in the Oceania colorway. I opted to make it longer than the pattern called for, and did the last edging row all the way around rather than just across the bottom as written. crochet cushion cover 3, a photo by tygger428 on Flickr. This is a “freeform” crochet project I started with the yarn I ripped out of my knitted Adult Surprise Jacket. Freeform means there is no written pattern, I simply crochet it as I go. So there is (and will BE no) pattern to share. I have a lone couch cushion I use to lean on when I sit on my bed that is falling apart, held together currently with duct tape, which I loathe as the duct tape sticks to the pillow, the mattress, etc. when I use it. As we live in a tiny studio apartment, my bed is my work table, my computer desk, my dinner table, my TV easy chair, etc. 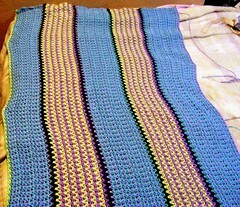 rick rack afghan 5 a photo by tygger428 on Flickr. I am now going around and around with single crochet on the edging, using up as much of the yarn in these colors as I can. simply cables scarf 2 a photo by tygger428 on Flickr. As I’ve put a bunch of rows on it, thought I’d post a progress pic of the scarf so far. This scarf pattern was designed by my friend Peter Franzi. 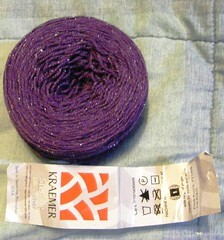 Kraemer Sterling Silk & Silver one ball a photo by tygger428 on Flickr. This is one ball of five I purchased at Stitches West 2011 to be used in my crochet designer friend Peter Franzi’s Diamond Shell Stole pattern. It has just a “pinch” of actual sterling silver in it, which is the slight “glint” you see in the pic. 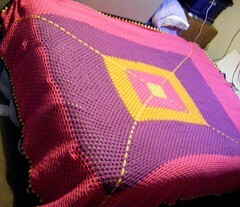 This is the latest progress photo of the rick rack afghan. Mary Jane Wood demonstrated this stitch at one of the recent Southbay Crochet (chapter of Crochet Guild of America, CGOA) and I “expanded” on it to make the afghan. Her demo patterns were a scarf and I think a potholder, I just opted to “blow it up” or supersize it. 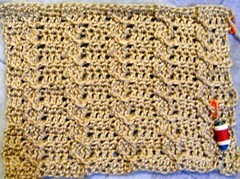 It is a series of V stitches, and is pretty much all double crochet. I cannot share the written pattern, so please don’t ask me to. This pattern was designed by one of my crochet buddies, designer Peter Franzi of Hookbear Creations. As I was home sick most of the long T Day weekend, I made good progress on this one. Unfortunately, I cannot share the pattern; the lady who demonstrated it at our crochet guild meeting “may” use it either in one of her future published patterns, or as part of a future class she may teach. So, as she is a friend of mine, I have to respect her wishes. Tropical granny square afghan finished! It is finally done. the very last row of yellow (see bottom edge near floor) ran out before making it all the way around so I finished it with black. 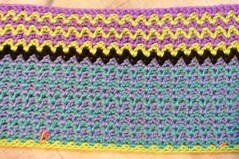 At Saturday’s Southbay Crochet (CGOA) meeting, Mary Jane showed us rick rack stitch. That is what I am using to do the “next” Project Linus afghan (using yet more Caron Simply Soft Brites, but different, colors, lime, blue mint, grape and berry blue I think the other color is called). 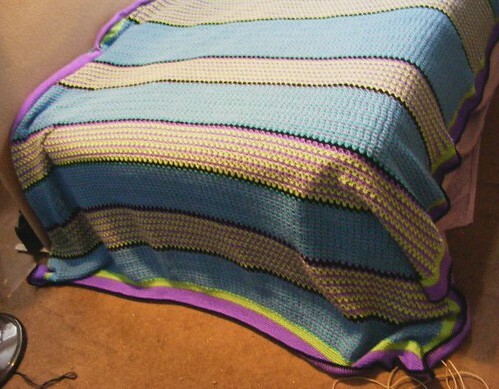 The tropical granny afghan is already washed, dried, and bagged up to bring to the next Men Who Crochet meeting.